Dang. Spring’s snuck up on me and the seasonal fly boxes are bare. Seems it's time to get the production line crankin’. Fast. March. White bass. I need some clouser minnows. April brings the shad. Clousers again. May stripers. Let me think. Oh yeah. Bigger clousers. The largemouth box could use a few too. Small clousers, big clousers, white and pink and chartreuse and red and gray and orange and olive clousers. And all the combos. But to start, the eyes. And, after the first fifty, I'm getting a little bug-eyed myself. Interesting approach. I've always tied on dumbbell eyes one fly at a time. I could see where this could be more efficient. Thanks for the unintentional tying tip... or was it intentional? Very creative way of showing us all how you do it better. Jay, I don't know that it's more efficient. It's just how I do it - which, actually, might imply just the opposite. 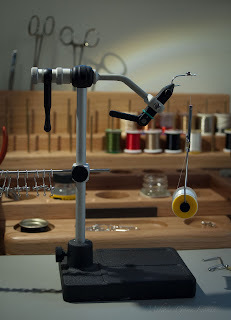 I've had two fly tying kits and never tied a fly. Can't find the patience. Joseph Meyer, former owner of One More Cast, now fly guy at Orvis Chicago, gave me a package of a product called Fish Skull. Tie on all the material first, then this slips over the eye. He knows my obsessive use of jigs and twisters, which is pretty much a clouser. 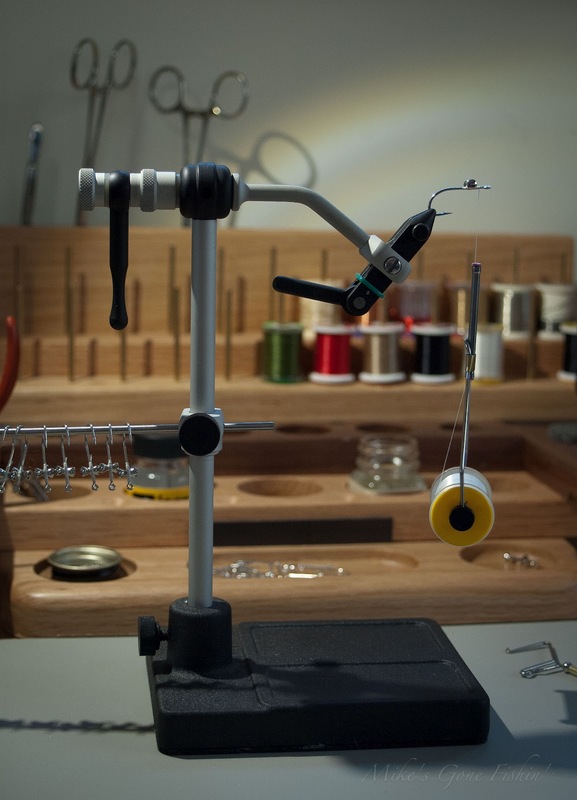 After looking through their site, I've seriously considered taking one of the fly tying kits away from my daughters. I bet they would not only work well on smallies, I could probably toss them with the light spinning gear I like to use. Methodical is not always efficient, it's just methodical. Tying the eyes on in a group certainly saves time. That's how the big time tiers do it...I don't. Ken, the Fish Skull products look very cool, though I have not yet tried them. And you're spot on regarding methodical. Thanks. Howard, I will never be confused with a big time tier, but I did sleep at a Holiday Inn Express once. The fish catching abilities of a simple clouser never seem to amaze me , not a fish in any type water that won't eat one. Never tried to tie fifty of anything in one setting to be honest...not sure I have the patience for it but I can see where it would be a big benefit for saving time. The beautiful thing, HPFF, about tying fifty sets of dumbbell eyes at a shot is that you can just turn your brain off and go. It's sort of nice, now and then. Fifty more today, 2s and 1/0s. Then, perhaps, some bucktail gets started. Or not. Chartreuse clousers - I like it! Most of our waters are polluted (to some extent) up here and don't have well defined hatches, as such the fish are picky but not "True to nature" picky. That's why in the Chesapeake watershed we say, "If it ain't chartreuse it ain't no use." I hear ya, Mud. In the Roanoke, where we do our shad and striper fishing, a favorite combination is pink and chartreuse. Tutti-frutti. If there's a natural baitfish that dresses like that, I don't want to know. That is some sick organization... My bench looks like a chuacabra puked up every bird it ever ate. Sick organization, Chris? You don't know the half of it. I swear that I'm undiagnosed OCD sometimes. I hated watching the TV show Monk with other people because they'd laugh at Adrian's actions while I saw nothing that I wouldn't do too. I think that there's the kernel of a future post in that.